Some of us (like my friend Ed and my mother) have a green thumb. Some of us (like me) have a black thumb. I either over-water or under-water any houseplants I try to nurture; low-maintenance succulents are the best I can manage, and even that is hit or miss. When you're planning the plants to put around your pool, you'll of course want to pick the prettiest species. But hold your horses! Yes, beauty is important, but there are more strategic elements you need to consider too. 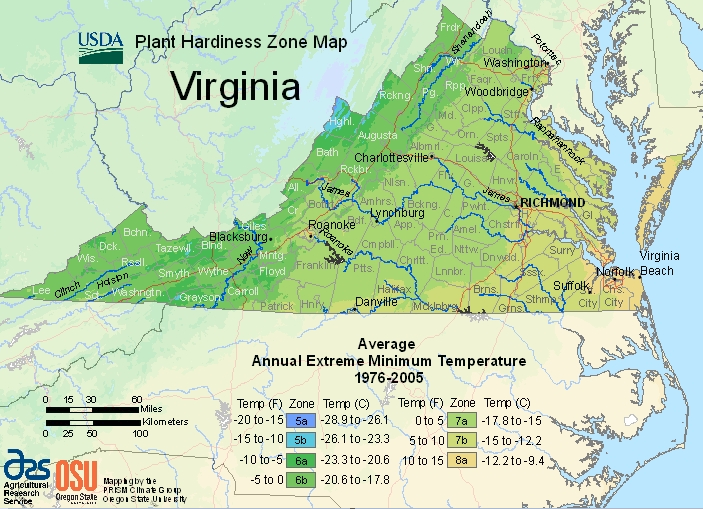 The USDA Agricultural Research Service provides a Plant Hardiness Zone Map to help you track what plants are most likely to thrive in a given location. It's color-coded (yay!) and ranges from icy 1a to toasty 13b, indicating the average minimum temperature from lowest to highest. Here in Virginia, our topography covers zones 5a through 8b. Translation: our annual minimum temperatures range from -20°F to 15°F, depending on the area. 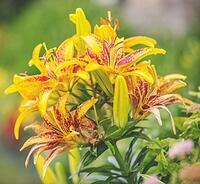 Look up your own state or ZIP code for a starting point on the types of plants that suit your area. However, the zone itself isn't the be-all-end-all in terms of temperature. Now, the word "microclimate" kinda sounds like your backyard is a mini-jungle, and I am all about that idea. What it actually means: a small area (like your yard) has a particular climate or characteristics that are different from the standard for the zone. For example, a Richmond street has a different microclimate from the whole state of Virginia or even the overall Richmond area thanks to the hot asphalt, partial shade from tall buildings, hard concrete, etc. Although you're in a certain zone, your specific area may have different characteristics that you should consider for plants. For a backyard pool area, you want to consider plants that can withstand hotter-than-normal temperatures. All landscaping will need to stand up to splashes from chemically treated water. On top of that, a saltwater pool requires more salt-tolerant plants than a traditional chlorine pool. Does the pool patio affect this tiny jungle? You bet (but probably don't call it a jungle in front of your pool designer). Keep the landscaping in mind as you plan out your patio, and vice versa. How much concrete or hard surface is around the plants? That will affect the microclimate. Different plants thrive along that city street than in a sprawling backyard. And consider the color and type of patio surface you choose. Light travertine can be 102°F in the summer sun, while dark bluestone right beside it can be 112°F. Takeaway: Generally, plants around a backyard pool need to be pretty tough—heat-tolerant and salt-tolerant. Learn exactly what environment you're asking them to live in. Is the plant easy to get to for maintenance? This is especially important for pruning trees, but it also applies to clipping shrubs and topping/deadheading flowers (and, of course, general upkeep like weeding and mulching). If the landscaping area is hard to reach, consider including plants there that don't require as much pruning or cutting back. This lets them do their own thing and reduces your future frustration levels. Consider whether the tree blooms and, if so, when. For example, crepe (or crape) myrtles aren't great around pool decks and patios because they bloom in summertime and create a mess when your family is using the pool. If you want a flowering tree, go for a species that blooms in spring. That'll give you time to clean up before swim season, and it won't mess up your summertime look. Look for trees that don't drop all their leaves into your pool. Heavy leaf loss in the fall can cause the same problems as blooming—a big ol' mess, along with potential pool-care problems if not cleaned up ASAP. For example, oaks and maples could become a maintenance burden. Evergreens are a great option for easy maintenance, as well as any plants that are easy to clean up and cut back for winter. It's not a huge deal, but it's something to consider, depending on how much you want to clean your pool. Takeaway: The less maintenance your landscaping requires, the better. How big will the plant get when it's full grown, in relation to the edge of the pool? For example, a ponytail palm tree might be 6–8 feet tall as a houseplant, but 30 ft. tall as a planted tree, with a base that can be 12 ft. across. That's big enough growth to eventually break into the decking. Although the plant may be small now, consider how it will look in 3, 5, or 10 years. Plant accordingly so that it won't outgrow its space and end up going into the pool or overtaking the patio. Takeaway: Design the landscaping to account for the lifetime size of plants you're considering, especially trees. How aggressive is the species in terms of roots? For example, willow trees and river birches have very aggressive root systems. Aggressive roots could actually damage the pool shell. 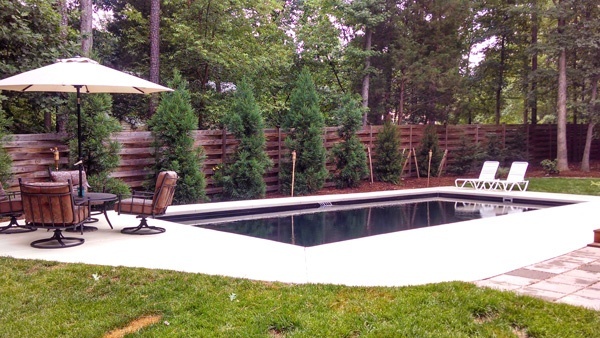 Look for trees that won't take over the ground, and plant them farther away from the pool itself. You can also include potted plants if you want the look without the worry. Takeaway: Plan for the root systems, and keep trees at a distance. What parts of the pool area will be in sun throughout the day and during swim time? Look at the sun pattern. The location of your house, any big trees, and so on can drastically change the sunlight levels even from one side of the yard to the other. Even in a small yard, you can plan for certain plants to live on one side or the other, depending on where the sun hits. Takeaway: Look for plants that fit the sun pattern in a given space. At River Pools, we design each customer's pool paradise individually. 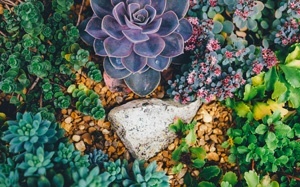 Each backyard's aesthetic is unique and depends on your chosen theme, the salt tolerance of each plant, where they are around the pool, and the environment (including soil and sun). However, in terms of plants, we do have some tried-and-true favorites! 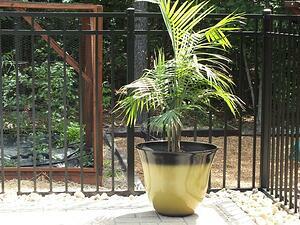 Aesthetic tip: If you don't have a lot of yard space and just want a touch of greenery, go for potted plants! Canna lilies look tropical, which is always fun. They like full sun but can do partial shade too, making them flexible for your sun pattern. River Pools designer Trey mixes ornamental grasses when he can. This category includes plants such as fountain grass, fescue, zebra grass, and rush. Be careful with bamboo, though, because it can take over the landscaping. Especially around our saltwater pools, we value flowers and shrubs that are both salt-tolerant and lovely, like day lilies and spirea and Japanese holly. 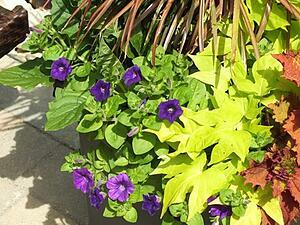 Creeping Jenny and the sweet potato vine work great for ground cover, trellises, and hanging planters. There's something so dramatic about draped vines, whether horizontal or vertical. I love it. The Ophelia shrub (a Lonicera variant) is evergreen and has small flowers, so it won't make a big mess. You can use it to create structure with style. In shady areas, evergreen ferns and hostas mixed with astilbe provide a colorful, varied aesthetic without compromising the life in your landscaping. Non-spiny succulents such as aloe, jade, and echeveria are easy to maintain. My plant-keeping friend Ed likes to say that they "thrive on benign negligence." Works for me! 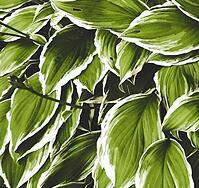 Bonus tip: Use multiple types of plants and stagger them to create texture and depth. Including them in odd numbers creates visual intrigue too. Boom bam, baby. And hey... wanna know a secret? You might decide that you really want a crepe myrtle or a ponytail palm tree. Go for it! The whole goal of designing your backyard pool is to put together a place you love to look at and spend time in. Just be aware that you'll need to spend extra time and effort on planning and upkeep so your paradise doesn't become a hot mess. Want more info for planning your pool? The big takeaway: Your pool area is a microclimate in itself. 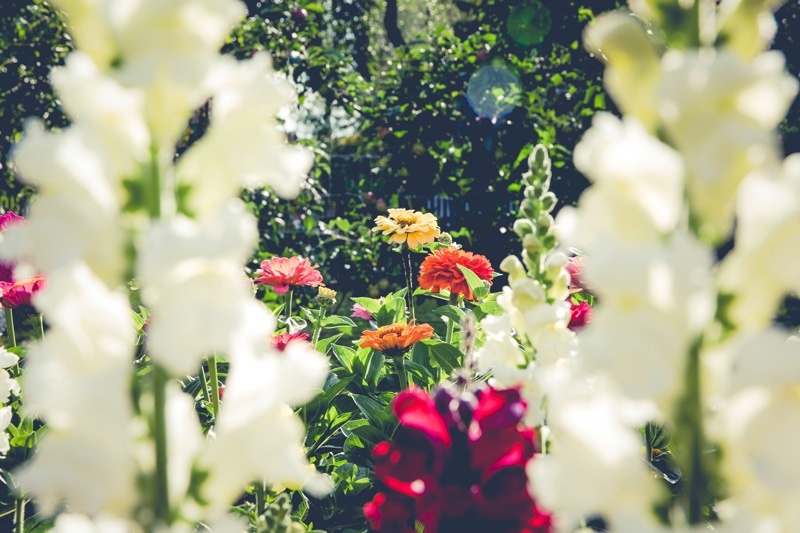 Although you might read that a plant is known for a certain thing, you need to take into account the environment you're putting it in (patio surface, sun pattern, etc.). A full-site assessment of the backyard will provide accurate info on what plants will work best for the space. Of course, landscaping is only one part of a much bigger project: your dream backyard, centered around a pool. That pool needs to stand the test of time to keep your masterpiece looking A+... and that starts with manufacturing. Whether you want concrete, vinyl liner, or fiberglass pool, vet your potential pool builders thoroughly and verify that they have the skills and experience to provide a high-quality, long-lasting product. At River Pools, we've developed Cross-Lynx Composite Technology, a unique combination of A) manufacturing best practices and B) cutting-edge materials that makes our fiberglass pools as strong and durable as possible. 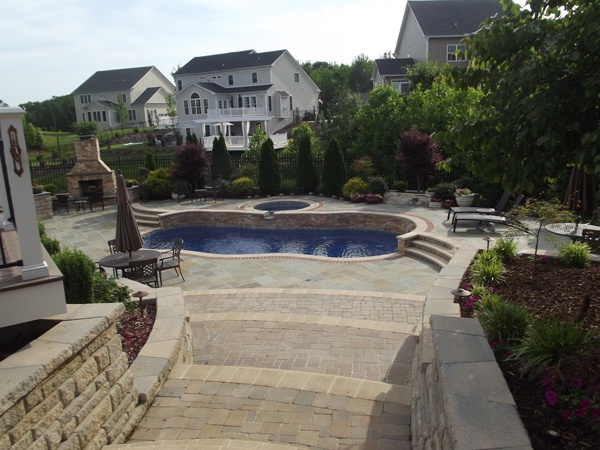 Based in Warsaw, VA, we at River Pools specialize in manufacturing and installing fiberglass pools in the Richmond area and in other states across the country through our dealers. Fiberglass pools are extremely easy to maintain, can be installed quickly, are very durable, and can be beautifully designed. However, their initial cost can be higher than vinyl liner pools, and the shapes and sizes are not as customizable as concrete or vinyl liner pools. For more information, check out our comprehensive, unbiased comparison of the three pool types.